If the Canadian Grand Prix organisers had written their own script for the inaugural Formula 1 race at their new Montreal circuit, they could not have asked for more. The 26-year-old Quebecois, Gilles Villeneuve, had the crowd dancing for joy as he clinched his first ever GP victory at his home track - exactly a year after he joined the Ferrari team. 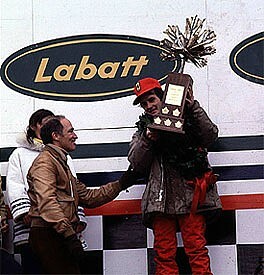 What is more, the naturalised Canadian entrant, Walter Wolf, who won the event last year, made it a one-two for 'Team Canada' when his driver, Jody Scheckter, brought the Wolf home in second place, 12.3secs behind Villeneuve. Jody, having his last race for Wolf before Joining Ferrari, was the meat in a Ferrari sandwich, as Carlos Reutemann followed him in third position, a further 6secs in arrears. It was a moving moment as the baby-faced Gilles, tears rolling down his cheeks, shook the hand of Prime Minister Pierre Trudeau and held the bronze Maple Leaf trophy high above his head to the chanting crowd. He had arrived. But, in the midst of all this, spare a thought for Jean-Pierre Jarier, who has been dreaming of such a moment in his life for the past five years. Never was it so close, only to be snatched away again, as here in Montreal. After claiming pole position, the Frenchman blasted his Lotus 79 into the lead of the 70-lap race from the start, and drove superbly. By half-distance, his lead was a comfortable 30secs, but on lap 49 his dream slipped away along with the oil from a tiny hole in his car's radiator. As the oil pressure started to fall, he was left with no choice but to park in the pits, and return to dream of what might have been. Behind Reutemann, Riccardo Patrese, a model of good manners, drove a fine race to come home fourth for the Arrows team, with a hard-driving Patrick Depailler a lighting fifth. 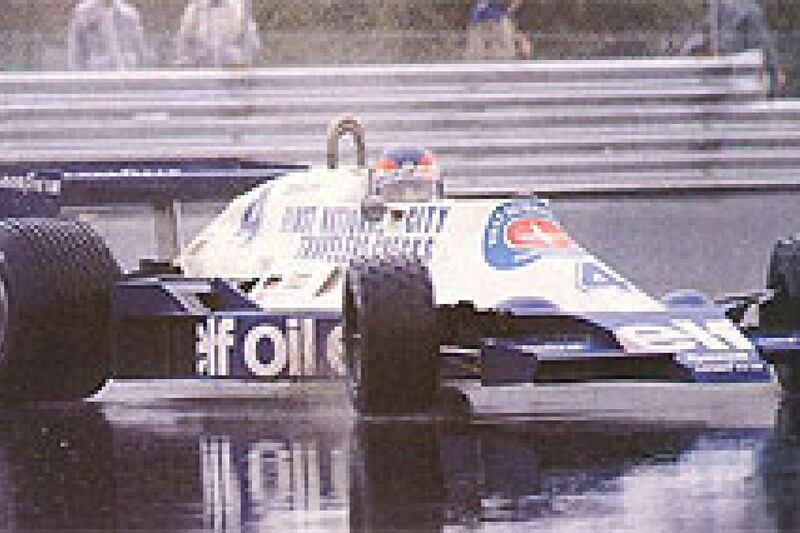 Despite a pitstop for fresh front tyres, Depailler went back from 12th to fifth in a typically gritty drive, his last of many for the Elf-Tyrrell team. Derek Daly scored his first World Championship point with sixth place after a good, steady drive in the Ensign, which is more than can be said for many of his fellow drivers this weekend. A first-corner shunt, when Hans Stuck spun his Shadow, saw Stuck and Emerson Fittipaldi's Copersucar eliminated on the first lap, and Jacques Laffite delayed in the pits before retiring later with transmission problems. Other front runners out of the fight in the early stages of the race included the new World Champion, Mario Andretti, who hit John Watson, and the second Brabham-Alfa of Niki Lauda, all out of the running by lap 6. Andretti, pushing Watson hard for fifth place, knocked hard on the door in a bid to get ahead at the hairpin, but Watson wouldn't open it. The Lotus 79 slid into the side of the Brabham, which killed Andretti's engine and chances of doing well, while Watson retired to the pits a couple of laps later with deranged rear suspension. Lauda's race ended all by himself when bad brakes, a common complaint at this light, twisty track, saw him slide over one of the chicanes and bend a front suspension pick-up point. It was not a race to remember - for anyone but Villeneuve and Jarier, that is. The heavy, grey clouds whisping away the tops of the square-cut Montreal skyline, their wet load spreading a silvery sheen on the streets below. A chill wind threatening to blow in the first of the winter snows, and sprinkling a golden carpet of maple leaves over the glistening lush green grass. Even a cold and wet autumn day could not drown the magical surroundings of Montreal's brand new race track, weaving around the futuristic buildings of the Expo 67 site on the man-made Ile de Notre-Dame in the St Lawrence Seaway. Three months earlier, with the Formula 1 circus lapping the tracks of Brands Hatch or Paul Ricard, the 2.8-mile Montreal track was little more than a dream. But for a whole island built from dreams. A race track built in time to hold the end-of-season Canadian Grand Prix was pas de probleme. With an investment said to be some $2 million, and the industrious ingenuity of the French-Canadian populace, a miracle was performed, and Grand Prix racing had its very latest race track. As for the track itself, perhaps it could be described as another Crystal Palace. The width could be greater, there are some turns that are too sharp and too many, but the whole place has an atmosphere almost out of context, as racing cars scream through tree-lined corners and neatly trimmed flower gardens only minutes from the noise and bustle of a major city. The general consensus of opinion among the drivers about the track, even before they had turned a lap in a race car, was that the width and the three chicanes - almost an over-reaction on the current trend to keep lap speeds low - were going to make passing difficult, add more driving hazards, particularly the tight single-car chicane right after the start, and present a braking problem for many. Other than that, there was little to complain about. There were spacious garages laid out at the end of the former Olympics rowing course. There was a wide, spacious pit lane, with neat specially constructed wood cabin pits. Officials did their jobs efficiently and courteously, and the CASC Quebec AC organisers bent over backwards to make sure that there would be no hang-ups. The only thing that was not well under control was the weather, and for all but the final hour of practice it did its best to try and upset the proceedings. Heavy rain throughout Friday spoiled the first two practice sessions, which the drivers were counting on to sort chassis, choose gear ratios and find their limits around this unfamiliar track. With the forecast predicting rain for Saturday's practice as well, there was no slouching. Any break in the clouds or even an easing in the rain was quickly jumped on by every one of the 28 runners battling for the 22 places on the grid. A missed lap in the momentary lull of the streaming puddles could be a vital one, and nobody was leaving anything to chance. When the track was at its worst, it was the Michelin wet weather shod Ferraris of Carlos Reutemann and Gilles Villeneuve calling the tune, right up to the end of the first day when, in the final few minutes with the track drier than it had been all day, three other cars broke the 2mins barrier to narrow the gap behind the Ferrari drivers. The thick, muddy run-off areas at the chicanes were churned up time and time again by countless off-course 'farming' sessions, the toll at the end of the day being two badly damaged chassis and several skirts, nosecones and other assorted bits of fibreglass. 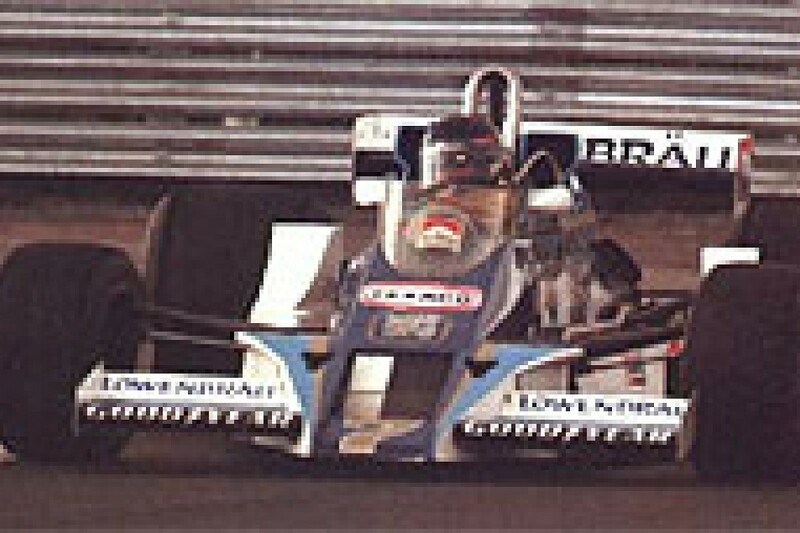 Bobby Rahal's Wolf WR6 was out of the event for good with front suspension pickup points smashed off the monocoque after Rahal slid off the road under braking and found contact with the metal barriers. 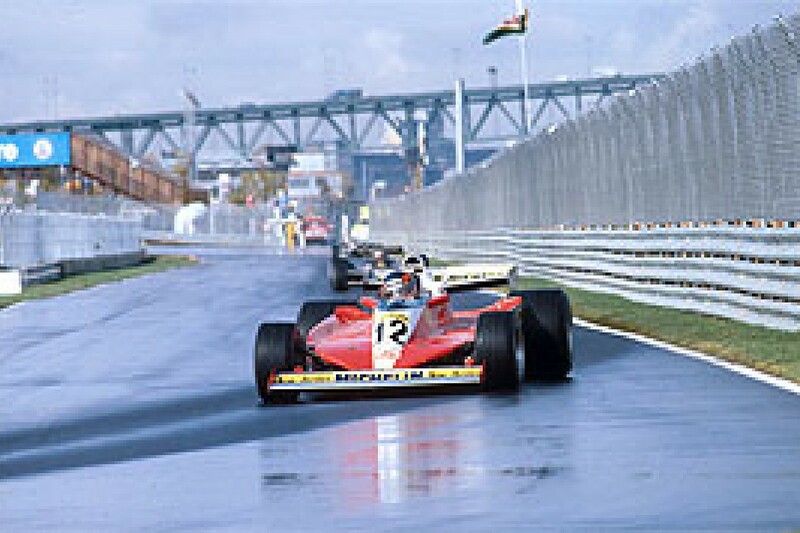 Clay Regazzoni's Shadow looked in a sorry state after the Swiss had wandered off the drier line and aqua-planed on a flat-in-fourth corner, knocking off a rear corner against the heavy cement blocks on another part of the circuit. Nelson Piquet's first ride with the Brabham team nearly ended prematurely when he pushed back the front suspension on one corner of the team's third entry at this race, the Brazilian lucky not to have bent the pick-up points as well. At the end of the first day, the area in front of the garages looked more like a farmyard than a race track as teams hosed off their mud-laden race cars. Behind the Ferraris, it had been Mario Andretti's Lotus 79 heading up the quickest of the Goodyear runners, while nobody was surprised to see Hans Stuck in fourth place on the time sheets, the German exciting everybody with his superb car control as he performed full power slides with the Shadow that had his dry-weather colleagues open-mouthed. Stuck was in his element, and even more delighted when Goodyear came along and offered him his choice of the different wet weather tyres available, including a new intermediate being tried in Canada for the first time: "It's the first time Goodyear came to me with special tyres this year. It was like Christmas." There was hardly a Christmas spirit around the Brabham camp, however. When the times were announced, not one of the three Brabham entries was yet in the race. "It's just got no grip at all in the wet," explained John Watson, who was the quickest of the three, but still out of the race by one place, 7secs off the pace! The Brabham team, needless to say, got more than their fair share of jokes directed their way, while Bernie Ecclestone hurriedly made fresh travel arrangements just in case it meant he could get home one day earlier. On Saturday morning, the situation was no different. Heavy rain saw most of the drivers, except Stuck of course, sit out most of the first untimed session, but when the rain eased and the track started to dry out for the first time in two days there was a frantic final 15 minutes, as everybody rushed out at once to try and gain any information that might help them in what, finally, looked like being a dry track for the last hour of timed practice. Two hours later, the track was completely dry, and there was almost the same tension in the air as at the start of the race itself. All 28 drivers sat impatiently at the end of the pit lane, revving their engines, waiting to be let loose for a time that would decide their grid position. As the dirt and dust began to clear the times began to tumble, and by midway through the session the crowded stands really had something to cheer about when the commentators announced that it was their own local boy, Gilles Villeneuve who held the quickest time. But hardly had the cheers died down before it was Jody Scheckter holding the quickest lap, while in the final few laps pole position was snatched by Jean-Pierre Jarier's Lotus 79. It was a first-class effort, which had the Frenchman smiling from ear to ear, despite suffering from a great deal of pain in his back. An uncomfortable seat position in his race at the Glen had badly pulled the muscles in his back, and he needed painkillers just to get through practice. It was going to be a tough race for Jarier, who planned more pain-killing injections to get him through, although starting from pole position was probably better than anything else on that score. His other main worry was brakes. By the end of the hour he was having to pump several times before the brake pedal came firm. Somehow, air was still finding its way into the system as it had in the past, and it was something he was going to have to live with. If Jarier had problems, they were nothing next to his team leader Mario Andretti, who found himself back in ninth place on the grid ("The furthest back I have started a race for a long time," reflected the new World Champion. Another practice session, and undoubtedly he would have improved his ill-handling chassis to a front row performance, but he ran out of time. "The side bite through the turns is bad. It's unstable under braking and the engine doesn't want to pick up out of the slow turns," explained Andretti, who was not relishing the thought of going into that first chicane after the start back in ninth place and then trying to get by the sort of hard drivers he was likely to find ahead of him after that. Later in the day his problems were traced to incorrect camber settings, an understandable mistake in the hurried changes from wet to dry settings. People like Scheckter and Villeneuve, who followed Jarier in the final times, were left with too many question marks like brakes, tyres, etc to wear the confident smiles they might have had had they been sitting on the front row after three hours of dry practice. While Villeneuve was as happy as could be expected on the second row of the grid, his team-mate Reutemann, like Andretti, had slipped way down the field in that final hour. He was back in 11th place after a practice session in which he described his car as "impossible to drive, oversteer, understeer, no grip anywhere." Supposedly, his car was set up the same as Gilles's, although from the different comments of the two drivers something was amiss. All 'Lole' had was an hour's pre-race practice on Sunday morning to find it, the usual half-hour being doubled because of the lack of dry weather running, particularly full tank tests. In the dry, it was still John Watson who headed the three Brabhams on the grid, the Ulsterman taking fourth spot on the grid in his last race for the team- His team-mate Lauda was seventh and Piquet a respectable 14th, without the use of qualifying rubber. All three Brabham drivers were complaining of a turn-in problem into the slow corners. Designer Gordon Murray pronounced what he thought would be the best remedy, and by Saturday night was winging his way back to England and the drawing board to carry on with the new car for 1979. There seemed a definite lack of interest in this race by the Brabham team. Alan Jones continued to show his good form of Watkins Glen, heading the third row with fifth best time in the Saudia-Williams, although running out of fuel half way around what he thought was going to be an even quicker lap did not leave him smiling much. Other than that the Australian was looking in good shape. The handling and brakes were fine, and if the car finished, he looked certain for another good placing. Emerson Fittipaldi was also looking good for a strong placing at this race. He qualified sixth alongside Jones, using race rubber, while he too was having slight brake problems which he hoped could be sorted out before	the race. Sharing the fourth row with Lauda was Stuck's Shadow, while Regazzoni, his repaired chassis not handling as well as it had before the accident, and without the soh tyres, failed to make it on the grid by just .05sec. Jacques Laffite shared the fifth row with Andretti, the Frenchman expecting to go much better in the race after running the final hour with still half-wet settings. 'The front springs were too soft. Every time I braked the front suspension went solid and I had terrible understeer into the corners. Tomorrow it will be better," he said confidently. Things could not be much worse for Reutemann on the sixth row, while for Riccardo Patrese alongside him things might also have been better had he not run out of fuel in the final few minutes. The second Arrows of Rolf Stommelen was among the six that failed to make it into the race. 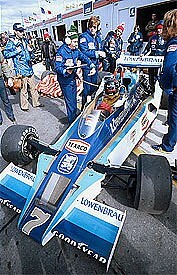 Patrick Depailler put the first of the two Elf-Tyrrell 008s on the seventh row of the grid ahead of Piquet, his team-mate Pironi back on the ninth row. The Tyrrells went no better on this tight, twisty circuit than they had at other faster ones throughout the season, which they had hoped to do. Derek Daly put the Ensign on the eighth row after a trouble-free practice, while Rene Arnoux did a good job with the Surtees to share the eighth row, despite not getting the quick tyres. Once again, his team-mate 'Beppe' Gabbiani failed to qualify the second Surtees. The final hour did not go well for the McLaren team. Patrick Tambay was just beginning to climb up the grid when his practice was cut short by an accident with Hector Rebaque, while James Hunt was forced to change to his T-car halfway through the practice. Tambay, on a quick lap, found Stommelen and Rebaque in his way at the hairpin. Rebaque did not see him coming, and the two cars touched, the Mexican's Lotus 78 limping to the pits with a bent rear wing, the McLaren with a bent top-link. That was enough to keep Tambay off the track for the rest of the session. Hunt had a throttle linkage fall apart, which saw his T-car back in 19th place when the session ended. Fortunately for Bobby Rahal, the original Wolf WR1 chassis was decorating the lobby of the Hyatt Hotel during the Canadian Grand Prix, After his accident on Friday, the mechanics rushed off to fetch it, and hurriedly race-prepare the car for Saturday's practice. Rahal who said the car felt better in the slower corners than the WR6 and more twitchy in the fast ones, justified his team's hard work with a place on the tenth row next to Hunt. Making up the final row of the grid were Keke Rosberg's ATS and the Renault turbo of Jean-Pierre Jabouille. Rosberg's place in the race was the result of a desperate effort which saw him spin no fewer than four times in the final session. "I had no rear brakes and there was no time to do anything about it, so I just went like crazy," said Rosberg, who put up a fine showing during the wet practice sessions. His antics paid off, for he got himself into the race at the cost of a couple skirts knocked off in his off-course excursions. For Jabouille it was a struggle. The turbocharged engine was losing him a lot of time picking up out of the slow turns, while the wet practice had not allowed him the time to set up the chassis to his liking. As well as Gabbiani, Regazzoni and Stommelen, Arturo Merzario, Michael Bleekemolen and Rebaque failed to make it onto the grid, their efforts on the hard tyres not enough to get them in the race. The morning warm-up session, extended to an hour because of the lack of dry weather practice, saw nothing untoward happen. Andretti switched from his race car to his T-car, preferred to race the T-car but could not, as it had slightly less fuel capacity and here they were going to need every drop they could squeeze in. Hunt had a preview of what was to happen to him in the race when the brake pedal disappeared after a few hard laps, while Jarier's biggest worry was the big needle they were going to use to give him a pain-killing injection just before the race, his torn muscle still giving him a lot of trouble. The injection might have dulled the senses in his back, but by no means had it dulled his reactions. As the light turned green at the start of the race, Jarier made a perfect start, just a nose length ahead of Scheckter alongside. Fears of a first-lap crash at the first chicane were well justified. Stuck, who had made a blinder of a start and was up into sixth place going into the chicane, found himself running out of road as he tried to take Fittipaldi's Copersucar around the outside at the entrance. 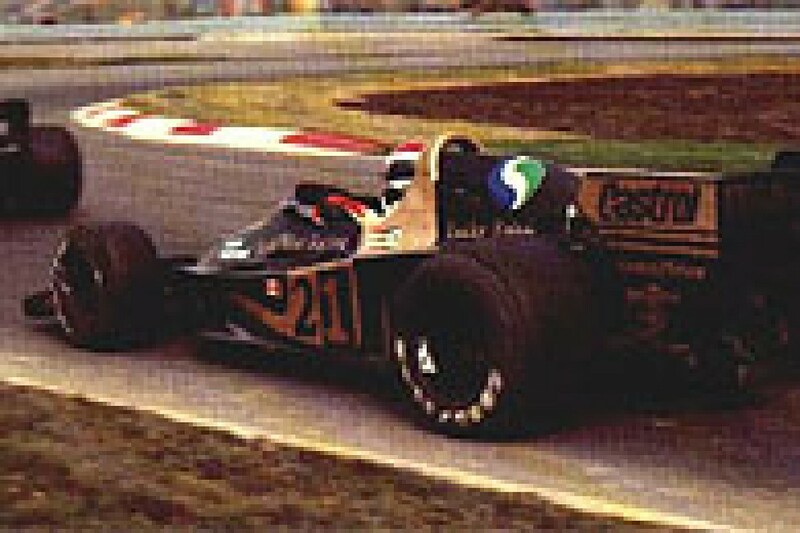 Off-line, and on the sandy edges of the track, the Shadow swapped ends, putting its front wheel inside the Copersucar's wheels and causing Fittipaldi to leapfrog the Shadow, bending both cars' suspension in the process. Lafitte found himself with nowhere to go but off the track when Stuck's car went backwards across it, the Frenchman shaking his fist at the German as the two cars rejoined the race. Stuck retired at the end of the lap, while Fittipaldi's rear suspension collapsed before he could make it back to the pits. Two turns further on, there was more trouble. 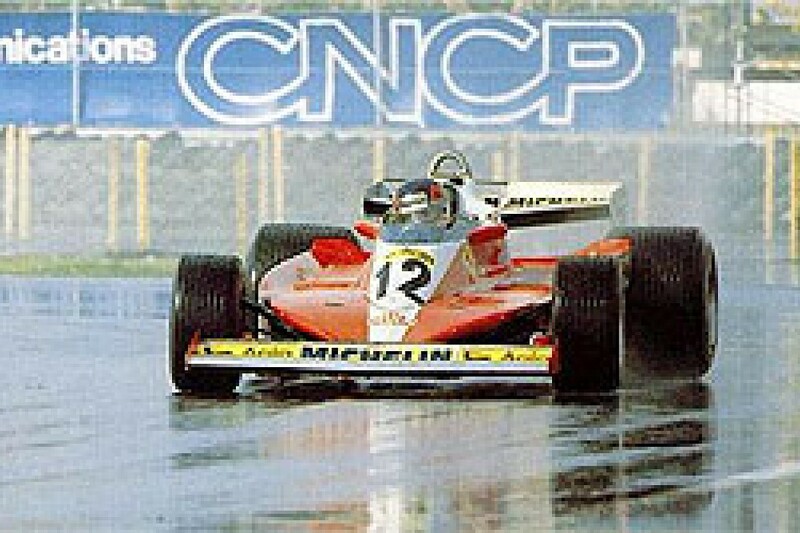 Arnoux, caught unawares by Pironi braking harder and earlier than he had anticipated, took avoiding action over a kerb and bent a steering arm, which forced him to stop at the pits for repairs. With only one lap gone, the field was effectively short of three cars, and another was running well behind the field. Not a good start! A sideways movement for Scheckter enabled Jones to take second place before the end of that dramatic first lap, Scheckter, Villeneuve, Watson, Andretti and Depailler all right on his tail. Even after just one lap, the black and gold Lotus was already noticeably clear of the rest. It was a sight we have been used to all season, only not with the unfamiliar green and white helmet of Jarier sticking out of the cockpit. Andretti was proving his own statement made earlier in the week, about how difficult it was going to be to pass here. For the first few laps, Mario tried all he could to get ahead of Watson's Brabham which, although slower than the Lotus 79 (as Jarier was able to prove with a clear track ahead of him), was fast enough to make passing impossible unless he made it easy for the American. Understandably, Watson was not keen to hand over fifth place just like that. Understandably, Andretti was getting more and more impatient, as on each lap he could see his chances of staying with the front runners moving further and further away. Finally, in desperation, he showed Watson his nose under braking for the hairpin. Watson, sticking to his line, was not about to open the door. Andretti was trying to bluff Watson into moving over. The Ulsterman held fast, with the result that the bluff went too far, and the next thing Andretti knew was that his brakes were locked up, and he slid on into the side of the Brabham. Both cars spun off, both cars had to be push-started by the marshals in order to restart. Watson headed straight to the pits to check for damage, rejoined the race, but then was back in the pits for good complaining of strange handling. It was not Brabham's day. As well as Watson, Lauda had also stopped at the pits on the same lap to retire his BT46 after an 'off' at one of the chicanes, when he could not muster up the necessary amount of braking. The incident had deranged the steering, so he too called it a day. Thank goodness there were still some people still racing, in particular Scheckter and Villeneuve for third place. After Jones had pulled out a brief advantage in the early stages of the race, they were closing up on him again for second place. Jarier had gone. The handling of Jones's car, which had started out good, slowly started to deteriorate, an oversteer characteristic getting worse and worse. Finally, with 18 laps to go, Scheckter found a way by, while a lap later so too did Villeneuve's Ferrari. Jones raced on, in fourth place place now, still not aware that it was a slow puncture causing his problems. Depailler's safe fifth spot had also been vacated by this time, his choice of front tyres for the race being too soft, and he was forced to pit to change to a fresh set. Rahal, going well in the opening stages to climb from 16th on the first lap to 11th on lap 9, was another to hit trouble when his engine suddenly started to misfire badly. He made several stops at the pits, where all the possible remedies were tried without success, the American eventually stopping for good with a suspected flap-valve problem in the fuel tanks. "It's been standing around so long, I expect the rubber flap valves have gone hard," said Peter Warr. With Depailler delayed, Reutemann moved up to fifth place, his Ferrari running the new construction tyres which were not proving to be the finest rubber for the conditions, as Reutemann had hoped. Villeneuve had gambled on the tried and proven rubber, which Michelin thought might be 'marginal' driving hard on full tanks, but they proved to be just the right choice. Reutemann could not match his team-mates' lap times, but his own were good enough to see him safely ahead of the rest of the pack. As Jones's car got worse and worse, Reutemann moved up to take fourth place, followed through by Patrese as the Williams headed for the pits and a new set of tyres all around. Jones rejoined the race back in 12th place, gearbox problems adding to his troubles, but he was still in a fighting mood. Despite having to hold the car in third gear, and having no fourth gear at all later in the race, Jones smashed the lap record several times on his way back to an eventual ninth place. A hard drive by Rosberg, from 14th at the start to seventh by lap 26, also came to nothing. An engine misfire saw him go to the pits several times for a change of spark box and battery, to no avail; the problem was eventually traced to a faulty metering unit linkage, by which time he was too far back even to make the results sheets. Scheckter's battle to hold off Villeneuve was getting more and more difficult as the race wore on. Finally, after 25 laps, the Ferrari slipped through into second place. The crowd cheered louder than the fans do for Ferrari at Monza! They were certainly enjoying the race, even if, as other races go, it had lost most of its interest in the early laps. Stopwatches showed that, even with Scheckter out of his way, Villeneuve was making no impression on the 30-odd seconds that separated him from the Lotus by this stage. Jarier had things taped, or so he thought. Shortly after half-distance, he felt the rear brakes start to go away. Soon they were down to nothing at all and, after another couple of laps, the dipping oil pressure needle told him why. "It was a little leak in the radiator putting oil onto the rear brakes." explained Jean-Pierre. who had no choice but to pull over once the oil pressure started to take a dive. His comments after the stop could hardly be heard above the cheers of the crowd, yelling themselves hoarse every time Villeneuve reeled in one lap closer to the chequered flag. By the final lap, the noise almost drowned the 500bhp scream of the flat-12 Ferrari engine. This moment had made the whole day worthwhile for the 80,000 people who had braved the freezing cold winds and dark snow-filled skies to watch 'their man' at work. He had done his job well, and took the chequered flag with both arms held high in the air, well clear of Scheckter in second place. Reutemann contented himself with third, enough to move him up to third overall in the World Championship placings, while nobody could criticise Patrese for his fine drive to fourth place, a nice end to a troubled first season for the Arrows team. Behind Patrese, only 4secs, Depailler took fifth spot. There was no question of the hard driving Frenchman giving anything less than his best in his last drive for the Tyrrell team, despite his earlier problems which might well have caused other drivers to throw in the towel. 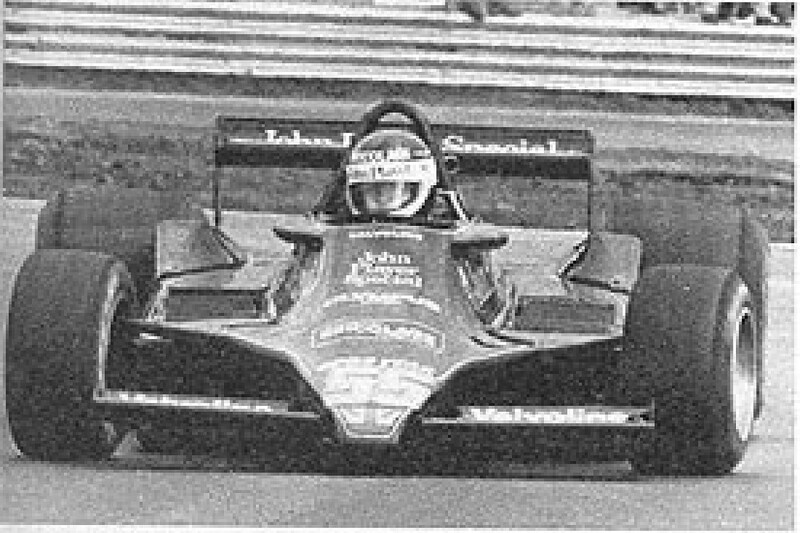 Daly also drove a very good race to finish sixth and take his first championship point with the kind of performance that will do both the Ensign team and the fast-learning Daly a lot of good if it carries on to the 1979 season. Seventh and eighth places went to Frenchmen Pironi and Tambay, who shared much the same problems throughout the race, a soft brake pedal and tyre troubles. With Tambay it was the rears, with Pironi the fronts, although neither driver stopped for a change, but preferred to drive around it in a bid to be there at the finish, as both inevitably are. Hunt, suffering from the same problems as Tambay, looked like following him home to ninth place, but became one of the final retirements when he went off the track at the hairpin a few hundred yards before the pits. A wheel had apparently come loose and turned on its pegs under braking. As Hunt braked, the M26 shot off the road and he found himself ankle deep in mud. Preferring the track to the mud, Hunt ignored the warnings of a track marshal and ran across the track, not far ahead of an oncoming car; this time, it didn't cost Hunt or the marshal as much as it had a year earlier at Mosport in a similar incident. After a couple of pitstops to investigate a suspected loose rear wheel, Laffite eventually dropped out of the race for good with a bad vibration from the transmission. which turned out to be a tooth off the main pinion. Arnoux's spirited drive came to an end just after half-distance when the oil pressure light came on and he could feel the engine start to tighten up. Jones's ninth place did not reflect his mighty drive despite big tyre and gearbox problems, his fastest lap coming on the very last lap of the race as he put in a big effort to pull in Tambay, having already unlapped himself on Villeneuve with three laps to go. Andretti took an eventual tenth place, nobody seemingly caring about his push-start, while Piquet got his Brabham to the finish in 12th place despite losing second and fourth gears. Before his troubles, which also included a broken exhaust pipe, the young Brazilian was running well and looks like justifying the confidence which the Brabham team have placed in him. The final finisher, after a miserable race which saw him end up five laps behind the leader, was the turbo-charged Renault of Jabouille: "The car was handling terrible because I cannot heat the tyres up properly by sliding the car because of the turbocharged engine. As well as that, the rear brakes boiled. and I lose several laps in the pits having the system bled, just like Zolder." Thanks to Villeneuve's win, the Formula 1 season ended on a high note, for it is always something special when a driver wins his first Grand Prix, even more so if he is lucky enough to do it on his home ground.